Natalie Portman's character in Black Swan captured our imaginations, blending the fragile and beautiful ballerina with something dark and sinister. No wonder everybody wants to be Black Swan for Halloween! Of course, the perfect way to finish your Black Swan costume is with a beautiful tiara inspired by the one worn by Natalie as Odile (the evil Black Swan) in the movie's Swan Lake production. Here you can make your own Black Swan style tiara using a few basic craft items found at home. Copyright: This tutorial, including all text and images, copyright of WordCustard, all rights reserved. Your Swan Lake ballet-style tiara begins with a simple piece of black paper. If you want to use black cardstock your tiara will be sturdier, which could be a good thing if wearing it out and about. If your paper is very thin, stick it to a piece of card for extra strength. A Letter/A4 size piece of paper is perfect as you are going to trim it down. Mark out an 8 inch by 5 inch rectangle. The finished tiara will be about 4 and a half inches high which is quite tall. If making for a child or a smaller head you might want to scale it down a little. This step is optional. However, if you cover your Black Swan tiara with a piece of thin plastic film it gives it the beautiful sheen you see in the photo of the finished ballet tiara. In the UK this plastic film is available in the supermarket or DIY stores on a roll, backed by squared paper. Look out for something similar in your country. Cut it roughly to size, peel off the backing paper, and stick it to the front side of your black paper rectangle. This step is easier than it might look. The movie Black Swan features a very modern and abstract tiara. Yes, it will be very hard to copy it exactly. However, anything that looks jagged and is pierced with holes will create the right look. Draw a template on a piece of printer paper. Copy my example or look at a Black Swan movie poster if you need a little help. You are aiming for a look almost like flames, with some large cut-out areas. Important - leave a space at the bottom edge with no cut outs. Hold your paper template over your black paper and then cut around the lines on the template. An alternative method is to cut out the template and then draw round it on your black paper using a white pencil, and then cut along those lines. For the cut out areas, it is easier to use a craft knife. If you don't have one, stab a hole in the center of the area you want to cut and then poke your scissors through. To keep the tiara on your head, you need to create a base for it. Do this using wire. The best kind of wire for the job is something like florist's wire (that's what I used). This is flexible but not too thin, and is coated in plastic. It is normally dark green which is not ideal but should blend in. Shape your wire in a circle that will sit nicely on your head without falling down to your face. I needed 2 pieces of wire for this. Join them with sticky tape. Tape in all the sharp ends carefully (especially for a child's tiara). Take the bottom edge of your tiara and fold it up around half an inch (or a little over 1 cm). Unfold and cut little triangles along the fold, as in the picture, so that it will wrap along the wire. Start at one edge and tape the first flap of folded paper up over the wire. Repeat along the entire bottom edge of the tiara. When you have taped the paper tiara to the wire circle, your Black Swan crown is complete! You can of course now decorate it if you wish to add some glitz and style. Personalize it with your own choice of glitter, black feathers, stick on gemstones, or anything else that you have in your craft box. Black Swan Ballet Tiara - Complete! Now that your ballerina tiara is ready, why not visit this guide to putting together a Black Swan costume and makeup. 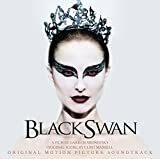 Includes a dramatic make up video to look just like Natalie Portman's ballet dancer character in the film and ideas for a ballerina tutu costume and ballet hairstyles. You might also enjoy discovering some Swan Lake costumes for classic ballerina tutu costumes and sweet dress-up ideas for little girls. Here you will find a makeup video inspired by Natalie's beautiful White Swan look. Be Dramatic and Dangerous as Black Swan! Did You Have All You Needed? Decora Clear Contact Paper 3 Yd. Be tickled pink with these 1/4 oz. packages of Long Marabou Feathers, 6 Inch . Beautiful Swan or Ugly Duckling, Leave a Comment! What a cool project, you've made it so clear there's nothing left but the fun. Great tutorial! The best costume props are the ones that are easy to make. Simple and effective. I like it. Thank you so much, Sylvestermouse. I know it's a look you had in mind for this Halloween and am sure with your crafting skills you would be able to create something like this in no time! 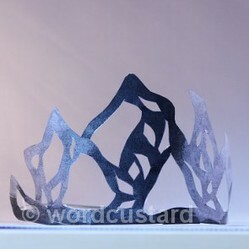 Wordcustard, your instructions for this fabulous Black Swan Tiara are excellent! I love your step by step instructions with photos to make a Black Swan Ballerina Tiara. So clear and easy to follow! Personally, I found the Black Swan tiara the hardest part of the Black Swan costume to duplicate. I am so glad you offered complete instructions for making this awesome Black swan tiara.